I think I just found my new favorite author! 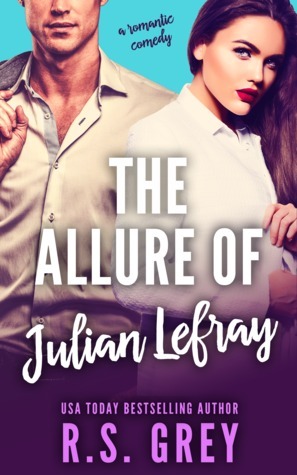 The Allure of Julian Lefray was the perfect romantic comedy. Josephine Keller has moved from Texas to NYC. She is hoping to be noticed in the fashion world. Since she was a kid she has always loved designer clothes. She has a small blog where she discusses fashion and she hopes to make a name for herself. Her first stop: to get a job as the assistant of Lorena Lefray. As luck would have it, Lorena is unavailable and her brother has taken over. One word to describe Julian: Dangerous! Julian moved from Boston to NYC to help his sister. He owns 49% of the business but he is stepping in to improve it. Hiring an assistant is necessary. He wasn’t expecting funny, smart and hot Jo to show up. He would not admit he wants to hire her because he is attracted to her. In the end, she gets the job and keeping his hands to himself is turning out to be impossible. I love the humor of this love story. The main characters complement each other to a T.
Jo wanted to succeed and I was pleased that she made certain Julian knew how important her job and her dreams were to her. I like how Julian was supportive of his sister. He took over to relieve her from the extra stress of the business while she was trying to regain her health. He also had great camaraderie with his buddy Dean (who has a book I need to read yesterday). He was beyond charming and sweet. Hard to resist.